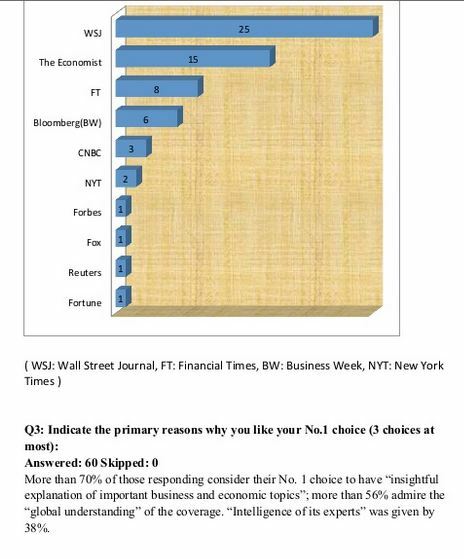 According to a recent survey conducted by the Donald W. Reynolds National Center for Business Journalism at Arizona State University, deans of 60 U.S. business schools rate Dow Jones and The Wall Street Journal as the highest quality providers of business and economic coverage in the U.S., followed closely by The Economist magazine. The deans, representing major business schools across the country, ranked 17 large business news operations, including broadcast and print. They were asked to critique the quality of the coverage, and identify each media outlet’s business reporting qualities. 70% of the respondents indicated that the best coverage must include insightful explanation of important business and economic topics. The deans also said they look for expert intelligence, accuracy in reporting (especially breaking news) and evidence of good investigative work. Singled out was The Economist for excellence in covering the economy, and Bloomberg for reporting corporate news. Dow Jones was seen as the leader in market coverage. You can be assured that the sources noted here as the best in coverage, quality journalism and intelligence have been part of the ProQuest Business Collection for some time. We offer full-text options for The Wall Street Journal, The Economist and Financial Times, while none of our competitors offers all four of the top titles. Fifth-ranked Harvard Business Review has been the subject of recent controversy over restrictions and extra fees around course use. View our blog post for access to our free list of 500 Alternatives to HBR articles, as well as tips for using ProQuest to support course work. To see the entire survey in Slideshare, click here. To see the article this survey is featured in, click here.